This post generated HUGE page views. I thank you, my dear readers, form the bottom of my heart. As always, if you enjoy my work please feel free to pass it along to your friends. CORRECTION: The use of the Prudential "Rock" and the "Pramerica" trade mark/name is part of a joint venture with Prudential Insurance. I had questioned the veracity of its use. Not to worry, according to my good friend, everything is on the up and up. IMPROVEMENT: I also neglected to include a bullet-point reference to the seemingly non recurring gains and write-ups going on at Fosun. Fosun listed write-ups, gains, and other accounting magic totaling RMB 22 Billion (US$ 3.4 Billion) with no discussion as to what these gains specifically relate to. (Footnote #6 - Page 153) Net Income was only RMB 8 Billion (US$ 1.2 Billion) for the period. If we eliminate these presumably "one time" non-recurring gains we conclude that Fosun actually lost RMB 14 Billion (US$ 2.2 Billion). Whether these gains/write-ups are legitimate or not, I'd expect the trend to continue. Like Alibaba, they apparently have a limitless supply of magic rabbits to pull out of their financial hat. "The Ramifications of China's Dual Currency System, Inherent Imbalances between the on-shore CNY and off-shore CNH, Its Impact on US Net Imports, Global FDI and the US Current Account; Parallels to the Post World War I Wiemar Republic and Possible Implications for Global Financial Contagion"
......but in this new era of million page views of kitty cats playing the piano.....I suspected, with a title like that, nobody would read it, so I went with the above captioned "Glasses and Handbags" instead. That said, I sincerely hope you'll continue reading....it really won't be that bad! You won't even know we're talking about global economics and currency imbalances. I promise. I'll try to present the material in a fun, thought provoking way using real life, every day language and NO MATH! (or at least really simple math, only when absolutely necessary). Perhaps you've heard that Coach has recently opted to close its company store on Alibaba's Tmall. Coach pulling out of Alibaba/TMall is the latest salvo in the continuing near-psychotic-scuffle between Alibaba and luxury brand managers who have been lured by the siren's song of the gigantic, untapped opportunity lying dormant in the bank accounts of the Chinese consumer, offset by the realization that the proliferation of knock-offs on the platform does their brands more harm than good. When we do a search for "Coach" on TMall we get 46 pages (60 items per page or 2,760 items) of "funny" handbags from US$50 to US$1,000....CNY at 6.7 per US$. When we take a look at the US Coach Store on-line....we see about 280 handbags ranging in price from roughly US$100 to US$1,500. 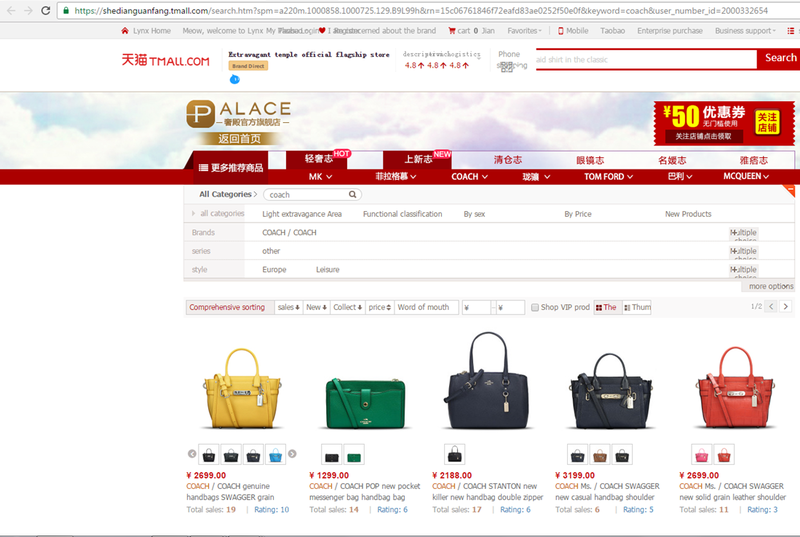 Moreover, the items listed on TMall generally have little resemblance to the items listed on Coach's company site. Perhaps these items are discontinued original items? Perhaps they are used items masquerading as new? Perhaps the Coach bags are modified for the Chinese market? Perhaps Coach has a program designed for authorized re-sellers like "Axonus Overseas Franchise", "Extravagance d' Attiude of France" or "Extravagant Temple Official Flagship Store". More likely, these obviously silly listings are just hundreds of untouchable merchants selling thousands of knock-offs, doing irreparable damage to the brand. By removing its store from TMall, Coach management is telling the marketplace that they've finally had enough. We were out sailing a few weeks ago and docked for dinner at a little taco place that we enjoy on Cleveland's "East Bank". When we got back to the boat, the sun had gone down, we were in a poorly lit area and I couldn't see the numbers on our companionway pad lock. My good friend, a patent attorney who loves gadgets, (His motto incidentally is "I can patent anything! "), pulled a key-fob sized device out of his pocket and handed it to me. The gizmo was actually a tiny case containing folding-stainless-steel-reading glasses, manufactured by Foster Grant. I hadn't seen these super-handy glasses before anywhere, but I quickly decided I wanted to buy a couple of pair. I went on line to see where I could find them. The first place I went was, of course, the Foster Grant website. The price was $24.99 a pair. Pretty reasonable I thought. But like 55% of all shoppers, I also decided to check out Amazon. Holy cats! What a bonanza! Hundreds of listings for these "Foster Grant-like" reading glasses. The prices ranged from $7.00 to $30,00 a pair. Checking another of my favorite sources for inexpensive "stuff", I found that similar glasses can be purchased on Walmart.com for $6.75 a pair from a Walmart-Authorized re-seller. I also checked out the local drug store and they had the Foster Grants for $30 a pair (no knock-offs available). I eventually decided to go with the unbranded $6.75 a pair glasses (Walmart.com) as opposed to the presumably authentic Foster Grants. Four pair for the price of one was pretty hard to pass up. Price & Quality Balance-The on-line shopping experience through company websites and intermediaries like Amazon, eBay, etc., gives the consumer the power to price shop like never before. Moreover, there's a certain implied trust that is embedded in the "satisfaction guaranteed" customer service model associated with most major on-line retailers. Customers expect that when they compare products, the representations made on the websites are accurate. They further expect that quality, terms of the sale and selling prices are credible and the transactions are guaranteed by the seller. Determining whether something is a "good deal" has become as efficient as it has ever been. Legitimacy & Security- On-line purchasers don't feel that they need to be Internet security, copyright, trade-name or patent experts. That's not their job. Simply put, if they are purchasing goods from a major on-line retailer, there's a natural expectation that the goods they are buying are legitimate, their personal information is secure and they should have a reasonable expectation that once they put their credit card information in the system that their identity won't be stolen, their credit cards won't be used illegally and their bank accounts won't be drained. Right or wrong, consumers have adopted this expectation and their behavior reflects it. Luxury Bands - Based solely on the significance of the counterfeit markets and proliferation of illegitimate, knock-off goods, consumers don't seem to care too much about the authenticity of the brands they purchase. They apparently care much more about looking like they can afford to buy the luxury brands (Rolex/Coach/Gucci, etc. at a deep discount) than they do about the legitimacy of the item itself. 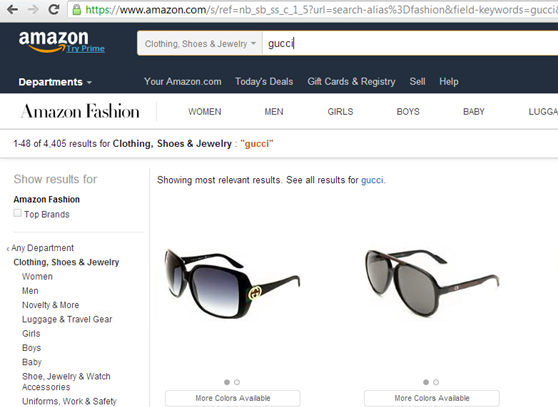 Once counterfeit goods appear on legitimate websites, their authenticity is unfortunately, validated and/or guaranteed in the eyes of the consumer. Most of us wouldn't think of buying a Coach bag or Rolex watch from a guy in an alley, but if we got 80% off on Amazon, we might not give it a second thought. Once an on-line seller establishes the above (warranted or not) credibility, security, pricing and quality benchmarks, be it through Alibaba, JD.com, Amazon, Walmart, eBay or any website, the sky becomes the limit for the seller. 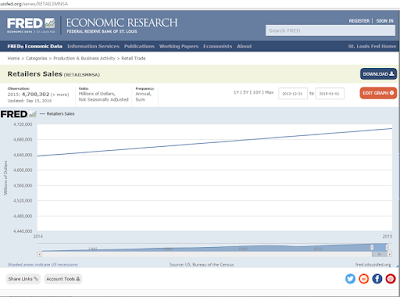 We calculate the GDP impact as $1,525 (C = $1,500 + $25) consumption Less: $153 Import Cost (X-M) or, a total increase of $1,372. Therefore, GDP increases by $1,372 when legitimate imported goods are sold by Coach, Foster Grant or on Amazon by authorized re-sellers. Now, using the same formula, let's look at the purchase of one (1) knock-off $200 Coach Handbag and one (1) fake pair of $7 Foster Grant-like reading glasses and again analyze the impact on US GDP. Let's guess that both products are manufactured overseas (again, perhaps in China or perhaps not) and the cost of each is $150 and $3 respectively. We calculate the GDP impact as $207 (C = $200+$7) consumption Less: $153 Import Cost (X-M) or, a total increase of $54. Therefore, in this example, GDP increases by only $54 when fake imported goods are sold by counterfeiters on Amazon/Walmart or any website in the US. Moreover, theoretically, each time a fake Coach and Foster Grant knock-off is sold on Amazon.com, it replaces a legitimate sale. 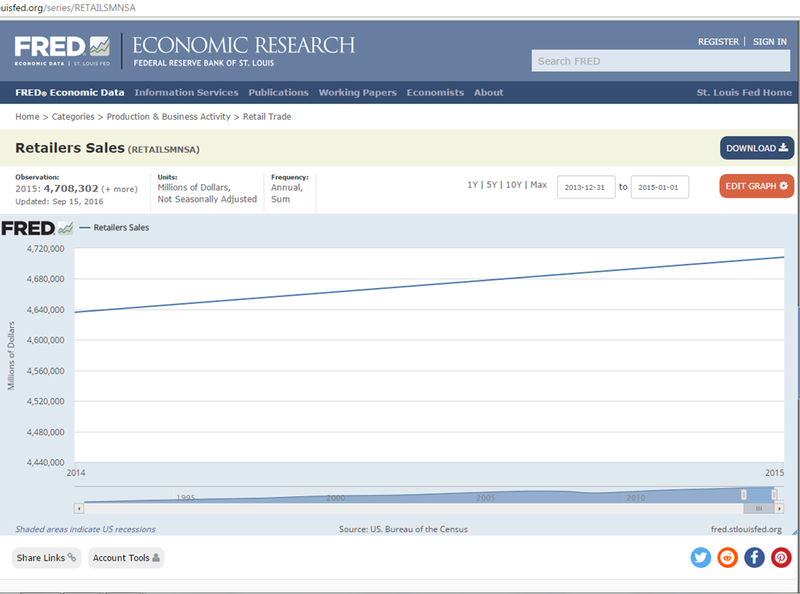 So in this example, this replacement reduces GDP by $1,318. ($1,372 - $54) i.e.) Put another way, GDP only increases $54 when it could have increased by $1,372 had the counterfeit item not be made available to the on-line shopper. You could also argue that, since the price for knock-offs is so reasonable, unit sales could/would/should increase dramatically. (I bought four pairs of glasses instead of just one) This phenomenon is actually a bonanza for the consumer. Middle class shoppers appear to be able to afford Coach Bags, Rolex watches, Prada sunglasses by the e-cart full. Moreover, intense price competition tends to drive selling prices down cutting margins to the bone, forcing high cost producers out of the game. Consumers are better off, economic activity increases and GDP should grow. It's all good. On the other hand, the trade-name, copyright and patent holders, and the aforementioned high-cost producers unable to access cheap labor, inventory and unlimited Chinese capital might all disagree. So how big is the "Amazon/Walmart Effect"? One amazing statistic is that 55% of all US shoppers start their shopping process on Amazon.com.....this, to me, is an incredible statistic. Amazon has become the repository for pricing information and the benchmark for what consumers believe they should be paying for a particular SKU. The "Econ's" dream of perfect price discovery is finally within reach. As of the end of 2015, Amazon had nearly 2 Billion items for sale on it's global platform. Interestingly, only 25% of the items are listed on the US site, the remainder are for sale in the EU, Japan, Canada, etc. Oddly, only 4 million items (0.2%) were items listed on Amazon.cn (Amazon China). We're lectured repeatedly by Jack Ma and Joe Tsai that China is the second largest economy in the world, the epicenter of e-commerce and that Alibaba, the e-commerce behemoth, soon to have US$1 Trillion (2020 forecast) in GMV, (compared to Amazon't paltry 2015 GMV of US$225 Billion) has dominated the Chinese e-commerce landscape from day one. There's apparently no room in China for a poorly run company like Amazon to gain a foothold. For some reason, Amazon has been able to become the dominant player in e-commerce around the globe, yet it can't sell anything in China. Conversely, Alibaba, can't seem to sell anything anywhere outside of China.....an odd anomaly, don't you think? Now, just for fun, let's take a high altitude look at the "authorized sellers" on Amazon. 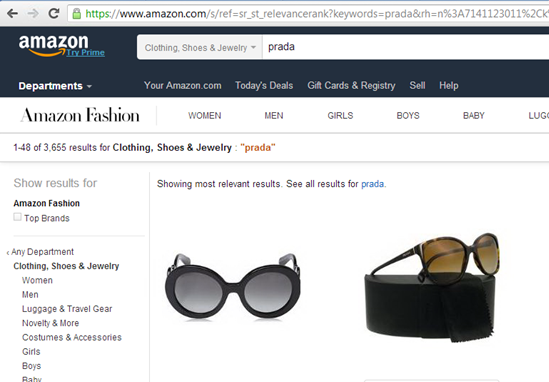 Let's type a few luxury brands into Amazon and see what we get. First, let's try Coach. As we can see, 8,051 items come up, presumably from authorized re-sellers, all at great prices compared to the manufacturer's prices on Coach.com. Interestingly, many of the items on Amazon.com, like TMall, bear little resemblance (other than having the Coach logo emblazoned on the item) to items currently for sale on Coach.com. 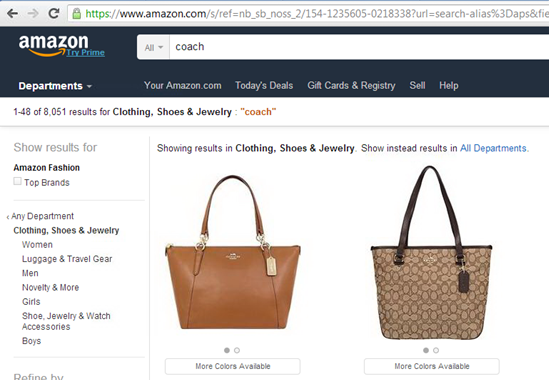 One of the Amazon sellers even lists that the purse is made from Coach's "Signature PVC"! A quick search of Coach's site found no reference to "PVC"....signature or otherwise. To me, it's surprising to think that Coach would advertise/brag that $1,500 handbags are manufactured from the same material that's used to plumb my toilet, as opposed to say, top-grain leather. I guess that just shows you how much I know about designer handbags. All of the above brands, and presumably many more, have re-sellers listing goods with dubious descriptions. There is a veritable river of odd wording and Q&A on the message boards. The theme is usually: Inquiry: "Is this a real Coach/Gucci/Prada?". The Response is always something like: "Oh yes....it are very real. We buy directly from Coach/Gucci/Prada direct. Good stuff. No problem." The message boards are littered with "This is not real....buyer beware" messages. As an aside, if I were a brand manager at Coach/Gucci/Prada, I'd be more than a little pissed off. When we think about this a little further, between Amazon (US$ 225 Billion) and Walmart (US$ 478 Billion), these two businesses contribute/control roughly 15% of all retail sales included in 2015 US GDP. Based on the GDP effect described above, even though these companies have generated enormous growth, we can observe/surmise that these business models have also been a significant contributor to stalling US GDP growth. The delivery of perfect pricing information is, by its nature, deflationary, driving prices down and cutting margins. This phenomenon has allowed consumers to significantly increase their purchases in unit terms, while reducing total retail dollars spent. Again, this is a bonanza for the US Consumer. Because of Walmart and Amazon, we no longer have to pay $25 for Foster Grant reading glasses and $1,500 for a Coach handbag. We can all suddenly afford multiple purchases of pseudo-luxury branded goods, albeit of dubious origin. But we don't care. We spend about the same in total dollars, yet as consumers, we are much better off because we get more bang for our hard earned bucks. The impact on GDP is further magnified because consumers, armed with perfect price information drive prices down across the economy. Why would someone pay $10 for a widget at the local hardware store when they can get it on-line or at Amazon/Walmart for $4? The "Amazon/Walmart Effect" has a dramatic impact on retail competition. Local businesses are forced to 1.) compete on price; 2.) find a way to offer either more services and/or other value; 3.) Become politically connected and hook up with a Chinese bank willing to provide unlimited, no-strings financing forever, or 4.) eventually close up shop, being unable to compete. Western Capitalism (as opposed to the happiness-filled-participation-trophy-riddled Chinese model) is truly a blood sport by comparison. When you add up all of the odd Vandelay Industries types of businesses that suddenly have instant access to global markets via Amazon, eBay, Walmart.com, etc. it's a wonder that more American retailers aren't already out of business. The composition of consumption and GDP has changed forever and will continue to evolve. Margin erosion is accelerating at an incredible pace. This erosion of course has predictable consequences. 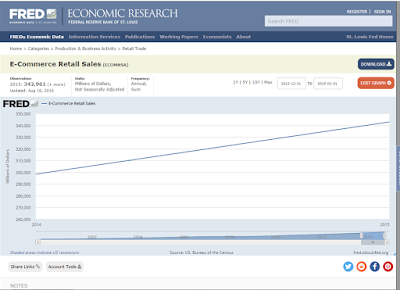 Retail real estate is worth less, shopping malls close down. There's significant segment consolidation and old style department stores will become a thing of the past. Yet, again, because of this sea change, the consumer has never been in a better place. We are in the midst of the mother of all currency imbalances. 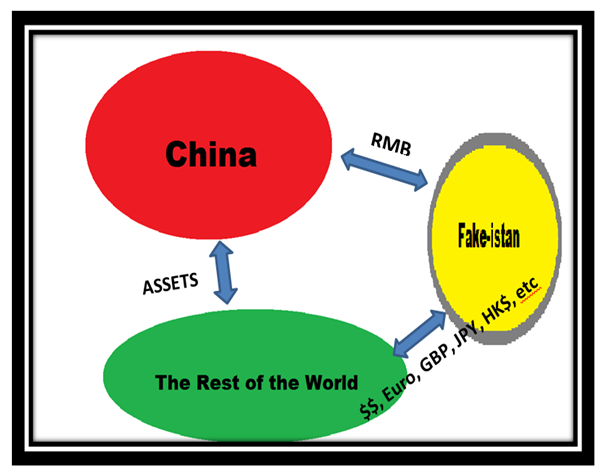 As I've described in the last post "Faking it....", the root of this imbalance lies in China's dual currency system. The "on-shore" Currency the CNY is only used to pay bills on the mainland. The CNH is only used to settle international transactions (Imports/Exports & Foreign & Outbound Direct Investment). 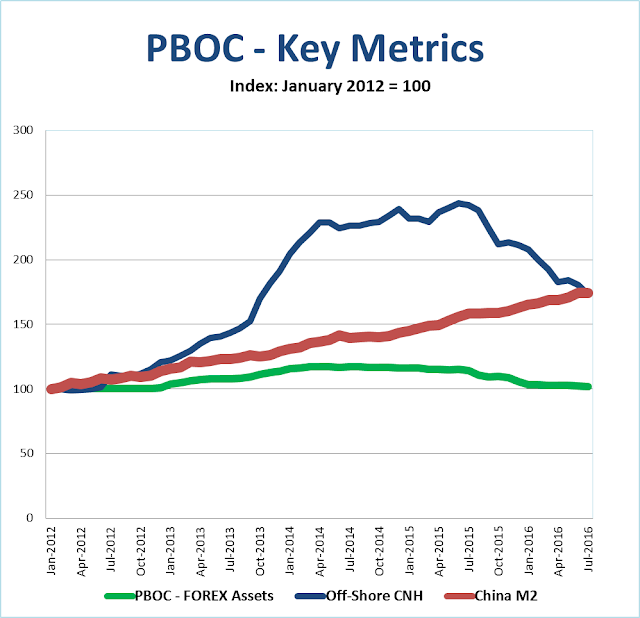 To the rest of the world, the "on-shore" CNY is irrelevant. The onshore currency can't be used for international transactions. China has traditionally reformed their policies step by step, via trial and error. CNH represents the "What if we fully liberalize RMB, make it fully convertible?" experiment. China has been ultra cautious on capital account openness owing both to the Asian financial crisis, and then the global financial crisis. How committed they still really are to making the RMB fully convertible is anyone's guess, but with XJP it seems a lot of those efforts have stalled. For example, the IMF let them into the SDR with the expectation of continued market reforms, at least at first that's what it looked like. But now the IMF seems to be less demanding on that front, which gives China the green light to do whatever it wants in terms of timing their reforms. Basically, all of that reform experiment stuff is out the door. CNH and its associated assets (Dim Sum bonds) are just ways for China Inc. to attract more foreign capital. Like, here, you guys have some of this "Mao money" and we'll take some of your international reserve currency.....yeah......fair trade..... trust me. Since the People's Bank of China (PBOC) does not publish the amount of CNH in circulation (at least to my knowledge). The only proxy/surrogate we have to estimate the CNH available for off shore transactions are CNH (off-shore) bank balances. 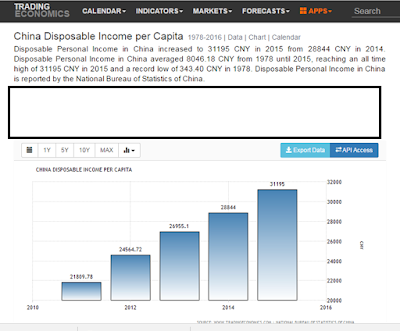 Let's take a look at some of the relevant data below, published by the PBOC. As always, the usual caveat applies: The figures that the PBOC publishes don't always make much sense, but like the young man with the crazy girlfriend once said... "Hey....she might be crazy, but she's all I've got." Now let's look at this level of CNH in circulation and make a few comparisons to US financial metrics per the schedule below. First, we note that China has much more broad money (M2) in circulation (205% of GDP) compared to the good old USA. (72% of GDP). Think about that for a second... Why, in both absolute and relative terms, does the Chinese economy suddenly need so much more money in circulation? Next, let's look at the ratio of CNH to the net demand for the currency. Every international transaction (Unless the PBOC spends FOREX reserves directly) requires the use of the CNH currency. The schedule at the left shows the sources and uses of FOREX. Exports and inbound FDI are sources of funds. Imports and ODI are uses of funds. These transactions need to be converted from foreign currency to the RMB (CNY/CNH) and visa versa. For example when a US Investor buys goods or a stock or a bond from China, he pays in dollars. The banks generally exchange the dollars for CNH, then to CNY and the exporter or seller of the stock or bond eventually receives CNY. The same happens (in reverse), when an importer or the Chinese purchaser buys a stock or bond. 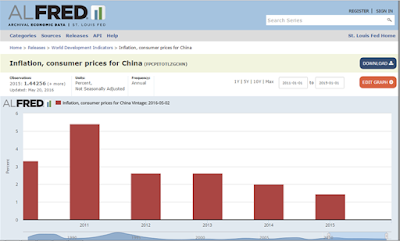 The importer or investor pays in CNY. His bank exchanges the CNY for CNH and eventually to the FOREX necessary to complete the transaction. The most remarkable aspect of this system is that there is a relatively small amount of CNH in circulation. In the above example, the average net monthly foreign transaction volume is 29% of the CNH in circulation in the selected offshore (HK, Singapore, Taiwan) banks. (Compared to just 0.2% of M2) The result is that the PBOC, because of their gigantic FOREX reserves, can make the value of the CNH virtually any number they like. Through open market operations the PBOC could buy up all/most of the outstanding CNH making it difficult/expensive to close open EX/IM and ODI/FDI transactions. Conversely, they could flood the market with CNH driving the value of the CNH down. In other words, despite all of the rhetoric about open markets and a free-floating RMB, the dual-currency mechanism gives the PBOC the ability to set the value of the currency at a price which might have no/little relationship to the fundamentals of the underlying economy. Now lets take a look at the change in the PBOC monthly FOREX balance. Again, we see that things don't seem to match up. You'd expect that since average monthly net Exports and FDI are still positive, that FOREX balance would be increasing. There is still more "money" flowing into China than is flowing out. 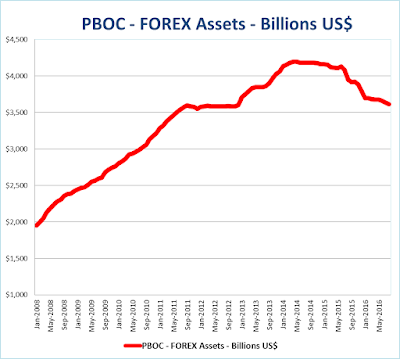 Yet, PBOC FOREX balances continue to decline. As many China watchers have observed recently, there is leakage somewhere. If there are any economists out there who have thoughts on this I'd enjoy hearing you on this topic. All the while, FOREX reserves and Off-Shore CNH Balances (The currency used to settle international transactions) have declined significantly. 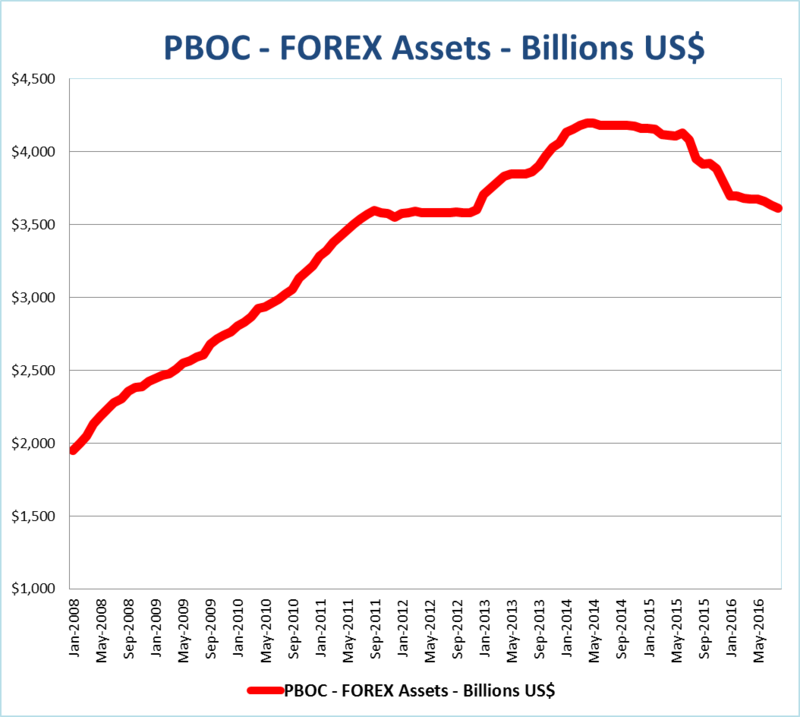 PBOC FOREX Balances (All of the reserve currency accumulated over the last decade while China had successfully become the world's manufacturing behemoth) have declined US$ 500 Billion (25%) since 2015. 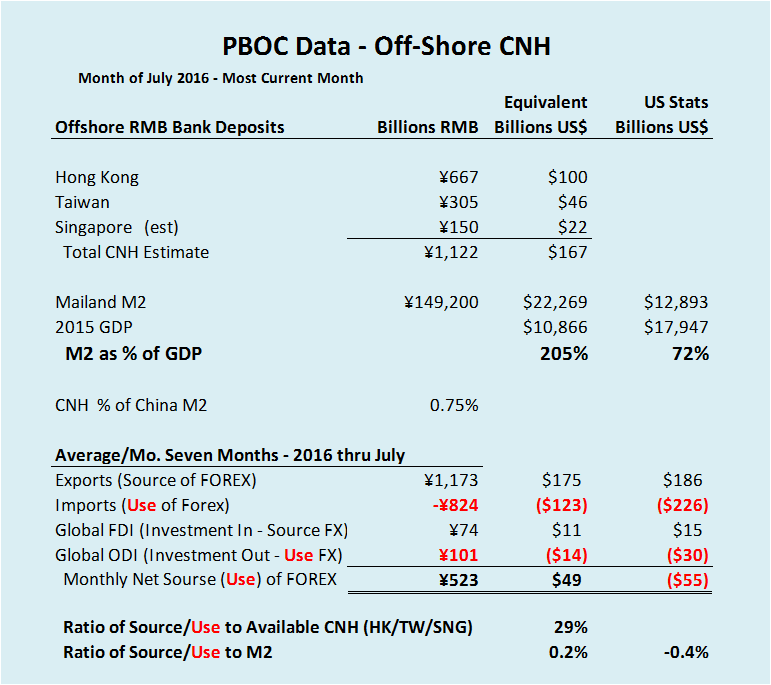 CNH Balances have declined nearly US$80 Billion (33%) from their high in July of 2015. 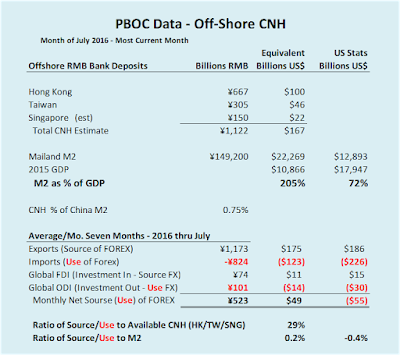 The off-shore" money supply is moving in a dramatically different direction than the on-shore "Mao Money". 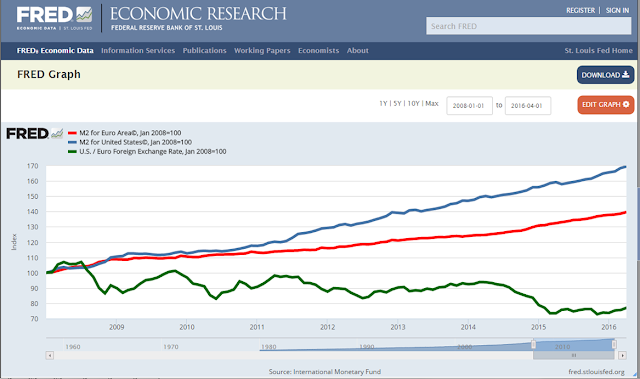 Let's make a few more comparisons to money supply exchange rate relationships. The FED chart below shows, by comparison, the growth of US M2, China's M2 and the $/CNY Exchange rate. (All values are indexed with January 2008 = 100) The FED has increased US M2 by a healthy 6% (Compounded) since the financial crisis. Not to be outdone, the PBOC has increased China's M2 at a whopping 15.5% Compounded annual growth rate (Again...not a typo) during the same period. As the chart also describes, the exchange rate has remained relatively rock solid in a range between 6.0 to 6.8 CNY per US$ since 2010. In fact, since its strongest point in 2014 (6.05 CNY/$) the CNY has only weakened slightly to 6.70 CNY/$ today. Wouldn't you think that, since there has been a nearly four fold increase in the supply of China's M2 that it would have dramatically depressed the exchange rate? (Authors Note: I've long opined that the CNY, if left to float, would be at 20:1....it would be worth a nickel.....not 15 cents.) In point of fact, the exchange rate has become primarily/solely dependent on CNH and FOREX balances. On on-shore monetary policy and money supply appear to be nearing irrelevance for the rest of the world. Without the dual on-shore/off-shore currency system, where the PBOC is able to shrink the "Usable" currency (CNH) in circulation, propping its value to what may be absurd levels, while simultaneously flooding the domestic streets with "Mao Money", this US$ exchange rate relationship would simply not be possible. Now, let's take a look at what a "real" currency relationship might look like. Let's compare the Euro to the US$. Both currencies are free floating so you'd expect the exchange rate to be predictable, at least within a relative range. Per the Chart below (January 2008 = 100) When we compare M2 for the Eurozone (4% Compounded Annual Growth) to the US$ (6% Compounded Annual Growth) we can draw some reasonable observations. First, we see that despite the higher rate of increase in US M2, the Euro has actually declined in value. It's worth roughly 75% of what it was worth in January of 2008. In 2008 I'd get $1.50 when I cashed in a Euro and today I'd only get $1.10, even though there are substantially/relatively more dollars available today than there were back in 2008. Economic outlook, debt levels, tail/headwinds, interest rates, politics, supply/demand for the currency, current account balances/deficits and a witch's brew of other factors all contribute to determining exchange rates. It floats! I'd be the first to admit that I can't predict (nor can anyone) with accuracy, the direction of a currency over the short term. On the other hand, given the data that's available today, with truly free floating currencies, it should be possible to at least understand the relationships between exchange rates and currencies over the longer term, as opposed to what's going on with oddly-pegged, gravity defying "Mao-Money" today. So, where is all of this newly printed on-shore (CNY), US$ 9.5 Trillion in the last few years, going? Remarkably, because of the State managed price/wage controls, all of this money printing isn't causing inflation. China's (fake) CPI has remained rock solid, under 3% and declining since 2012. Based on the wild expansion of the money supply, we would not think that this could be plausible, but yet, per the magic of the NBS, there it is! Contrary to popular opinion, all of this money printing is NOT increasing Consumption in any meaningful way. Consumption, as a % of GDP (if you believe the silly, guaranteed, rock-solid 7% annual GDP figure) has remained constant for the last few years at roughly 50% of GDP. Moreover, as is relatively common for the NBS, when the figures don't track with what they'd like them to be, they either pull numbers out of a hat, or stop publishing the data altogether. The last time Total Consumption as a % of GDP was published was as of 12/31/2014. 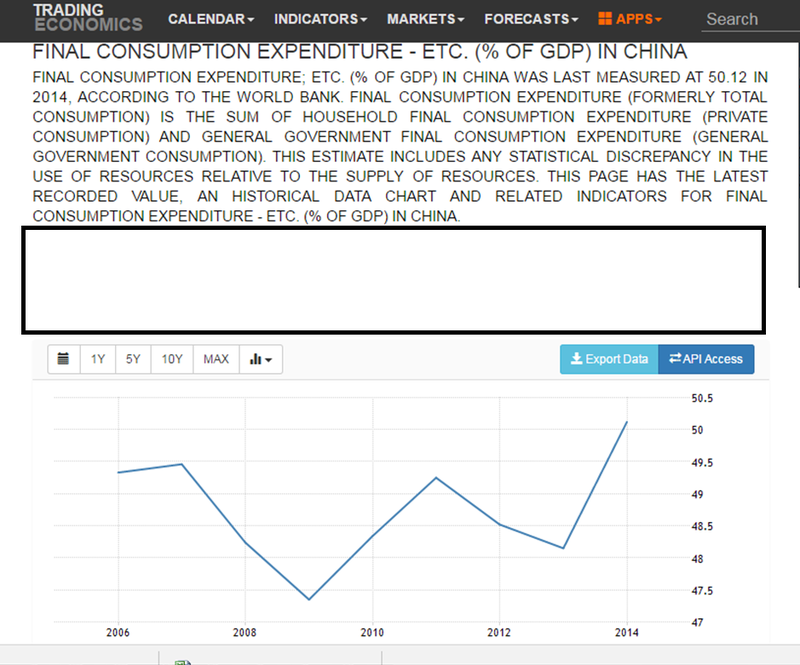 So we've established, at least in big bold strokes, that both prices and domestic demand for goods (Consumption) is relatively flat when compared to China's published (fake) GDP given the monumental M2 increase. Now let's take a look at where all of this dump-truck money really is going. Chinese workers have had a relative bonanza in wages. As described by the chart on the left, Average Wages have increased at a rate of roughly 11% a year since 2011. 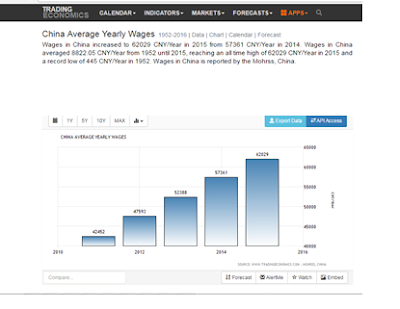 The chart is in RMB, but when we convert the figures to US$ we see that wages have increased from US$6,531/yr. in 2011 to US$9,549/yr. in 2015, a total payroll of US$7.4 Trillion when this figure is applied to 775 million employed Chinese workers. This yields a US$2.4 Trillion pay increase over 2011. Not a bad raise, if you ignore the working conditions and long hours. I know a few Chinese managers and I don't recall them ever mentioning how they occasionally storm into their bosses office, rip him/her a new one, and demand a raise or they'll take their talents to South Beach.....perhaps they love their jobs so much that they would just do the work for free if asked? Perhaps Chinese bosses are more compassionate and caring than Western managers? Anyway, this uniquely American negotiation strategy is apparently frowned upon in China. Or when it's attempted we seem to lose track of the whereabouts of the rogue employee. That said, the system seems to work, who am I to criticize? So what do all of the employees do with this US$2.4 Trillion annual windfall? They invest it of course! Disposable income has also increased at a 10% clip, from US$3,300 a year to US$4,800/yr., (or as of 2015, US$1.1 Trillion annually). But we've already established that despite what Jack Ma and Joe Tsai would have you believe, 1.3 billion Chinese consumers apparently don't spend all day shopping on the Internet for knock-off western brands. 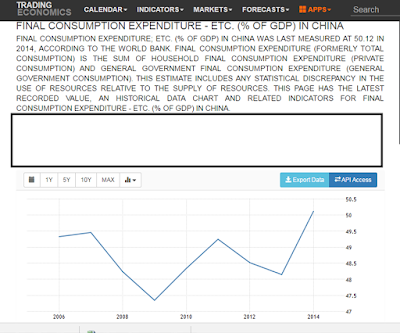 Consumption as a % of GDP has likely remained relatively constant at roughly 50%. But in the true spirit of Western Capitalism, why would you only invest the windfall you've received from increased wages? What's the most logical thing to do as a brand-new, true, dyed-in-the-wool, free-market capitalist?....Why, you lever-up of course! The chart below shows us how Household debt in China has increased (Compared to China's M2) by a multiple of 5x to nearly US$4.2 Trillion since the 2008 base year. 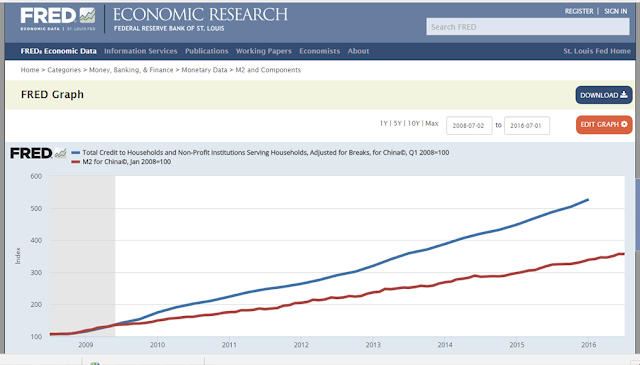 Household debt is now roughly 40% of (fake) GDP. The rate of increase is accelerating. So now, as a newly reformed, market forces driven Chinese investor, you have to decide...where should you put your new wages and borrowed money? The stock market has pretty much "sucked" since you lost all of that money last August (2015), so safety, as always, is of paramount concern. Of course, the logical answer is to put your money in the Chinese Bank/Shadow Bank system. You would plow your money right back into the system, buying un-guaranteed Wealth Management Products (WMP's) that pay an oddly high interest rate, you'd participate in P2P lending and other exotic, high-yield products that you don't understand because, after all, they are promoted and sold by a large, trusted Chinese Bank. What could possibly go wrong? Finally, the most important thing you'd accomplish with all of this newly printed money, would be to upgrade your house. (Chart Left) And while you're at it, buy a few more apartments for the kids and grand kids. Times are good! Inflation is low, wages are going up, House prices never go down and money is flowing in the streets! It's an AWESOME time to be a Chinese worker/manager/executive. Now let's say, you have worked your way up out of the day-labor rabble, you've become politically connected and you have made tons and tons of newly printed money. You are one of China's elite. You can afford to send your kids to US Schools and you've set up some shell companies and opened a few bank accounts in the Caymans and Panama. You start seeing the absolute bargains out there as far as US/European assets go. You start buying up all of the stocks/bonds and New York Condos you can get your hands on because you know you are trading Mao Money for real assets. In the first seven months of 2016, thru July, ODI (Outbound Direct Investment) has for the first time in any year I can recall outpaced FDI in China. 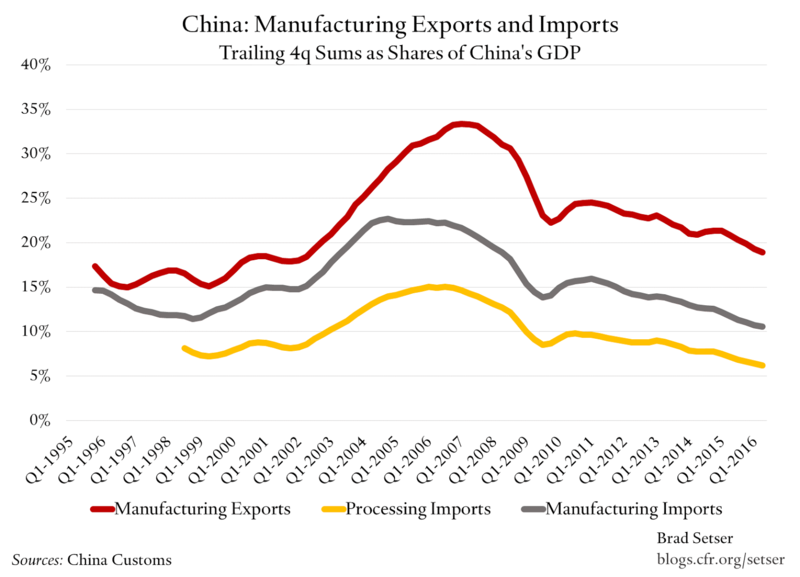 China has become a net exporter of capital. More Capital (money) is going out than is coming in. China's Outbound Direct Investment (ODI) spiked to $103 Billion in the first seven months of this year registering a 61.8% increase YOY and overtook the Foreign Direct Investment (FDI) of $77 Billion. This trend is expected to continue, China is expected to be the world's largest global investor (Outbound FDI) by 2020. In the graphic to the left Brad Setser, Acting Director of the Maurice R. Greenberg Center for Geoeconomic Studies, also did some nice work illustrating the decline (% of GDP) of Net Exports as well, falling from their peak prior to the US Financial Crisis to a net of roughly 5% of GDP (Manufacturing Exports Less: Manufacturing and Processing Imports) today. 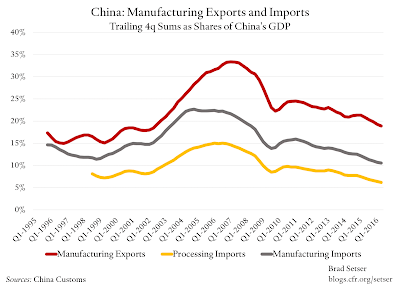 The recent global slowdown has caused the West to be significantly less dependent on Chinese manufacturing. Unfortunately, less money coming in and more money going out usually doesn't bode too well over the long haul. So how could all of this have happened? A ballooning on-shore money supply, accelerating domestic debt and wages, skyrocketing real estate prices and shadow bank assets, the proliferation of WMP's and miles of excess capacity and vacant ghost cities. All of this accomplished with near zero % domestic (CPI) inflation. The off-shore story, of course, is much different. Chinese exporters are willing to accept almost any amount of FOREX for their cheap reading glasses and handbags now, groveling to trade Mao Money for dollars. Chinese investors are happy to pay any price for Dollar/Euro denominated assets The aforementioned was accomplished solely through the smoke and mirrors manipulation of a fake, off-shore currency. Somehow, the Chinese government has been able to convince the world that, through its dual currency system, that the CNH has real value (15 cents), when history and the available economic data would tell us otherwise (it's worth a nickel or less). Again, the Chinese economy is the only large economy in the history of finance to use ( or better described "get away with") a heads-I-win-tales-you-lose, dual-currency system. Now, let's say, that the Offshore CNH isn't just a currency....let's say, just for fun, it's a sovereign nation with its own economy. The Fake-istan economy is uniquely dedicated to banking and financing Net Foreign Direct Investment (FDI/ODI) and Import/Export transactions. Based solely on a drawing proposed by my five year old nephew, the economy of the Peoples Republic of Fake-istan would look something like what we see on the left. Following the diagram, hard assets, goods and services would be exchanged between China and the rest of the world. Currency would flow into Fake-istan and the FFS (Fake-istan Financial System) would settle the EX/IM and ODI/FDI transactions, converting CNH to other currencies and visa versa on an as needed basis. First, let's say hypothetically, that the Peoples Republic of Fake-istan can issue and retire any amount of currency (CNH) it chooses. Let's also say that Fake-istan has significant FOREX available (or on loan from China), something like US$ 3.5 Trillion available, to buy up virtually any amount of CNH and support the currency. Let's further suppose, by controlling the supply of CNH outstanding, with sufficient FOREX reserves, Fake-istan is fully capable of causing a CNH shortage at anytime. They'd just "buy 'em" to drive the value/price up "Sell 'em", flooding the market with CNH to to drive the value/price down. For example, when a foreign Purchaser of goods has to settle the transaction, and there's a shortage of settlement currency (CNH), his cost goes up. Conversely, if there are boatloads of CNH available his cost goes down. Could you imagine what would happen if the "real" value of the CNH were realized? Cheap reading glasses and fake Coach bags would be discounted another 66% for US on line shoppers The Syngenta, GE Appliances, Blackstone, deals, et. al., would have been three times as expensive for the Chinese acquirers. All of those newly ordained Chinese Billionaires would become less exuberant Chinese millionaires. (Or insolvent if they have significant liabilities outside of China ($/Euro debt) collateralized by mainland assets. So what have we really woven together here? These are the summary bullets. There are numerous, unfettered, deflationary channels (Walmart, Amazon, etc.) available for counterfeit/cheap foreign consumer goods to find their way to US and European Markets. 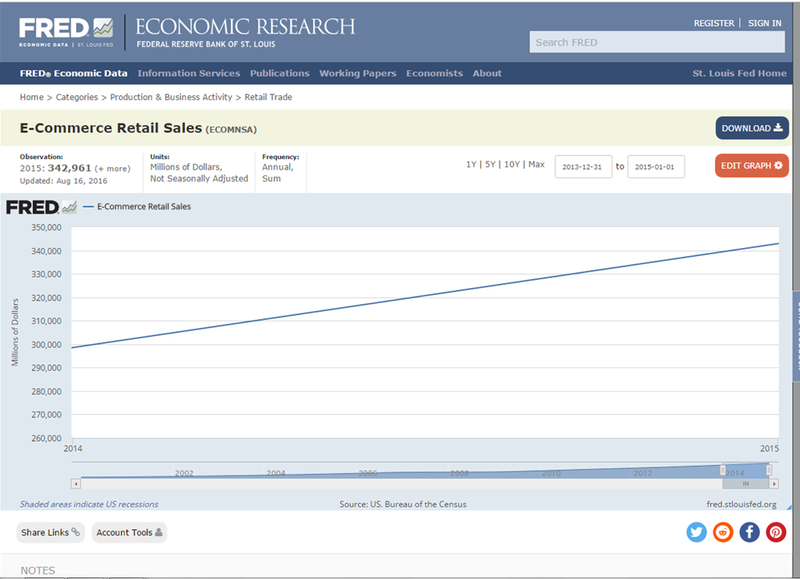 The composition of the US Consumption component (C) has changed dramatically. The value of this consumption is enormous in aggregate, but because of the associated near-perfect price discovery, the net impact of the "Walmart/Amazon Effect" is actually a drag on consumption and US GDP, as well as a source of FOREX for Chinese sellers. This GDP erosion is made possible in part because of China's dual-currency system, which enables the Chinese Central Bank to manage the value if its global currency (CNH) to a benchmark which is becoming more removed from its real economic value by the day. This artificial strength, allows Chinese sellers of goods, as well as Chinese Investors to trade their Mao Money for real, reserve currencies/assets which are actually tied to the economic fortunes of the issuing country/economy. The rapidly expanding money supply, debt levels and massaged NBS/PBOC data effectively mask the accelerating deterioration of China's on-shore "real" economy. The cycle of on-shore monetary expansion has probably become irreversible. The only time in history, as far as I can determine, when we've had anything close to this level of monetary gamesmanship was in the post WWI Wiemar Republic. It will be tough to describe the Wiemar mess in a couple of paragraphs, but I'll give it a shot. The German government, as you might recall from your grade school history books got into quite a financial pickle when they started that little brouhaha which eventually came to be known as "World War I". The Reichstag's idea was to take over resource-rich France, England and Western Europe and use the spoils to pay for all of the debts they ran up while prosecuting the war. When you put all of the evil, carnage, death and brutality aside, on paper, it actually looked like a really great plan. But like many diabolically great, evil plans on paper, occasionally, things go awry. The Germans, as we now know, ended up losing the war, and of course the Allies were pissed. They demanded reparations, and by God reparations is what they would have. So like all pissed off victors, they came up with a ridiculous amount of money they wanted to collect, set the German government up on an installment plan and gave them a couple of deadlines to pay the money back. 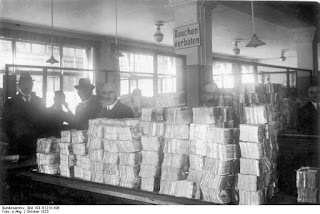 Since you can't get blood from a turnip, the Reichsbank said: "Ok you Allied-holes want reparations?....here are your stinking reparations....I got your reparations right here!" That's when those tricky Germans came up with a dual currency system. All of a sudden, there were two Marks. 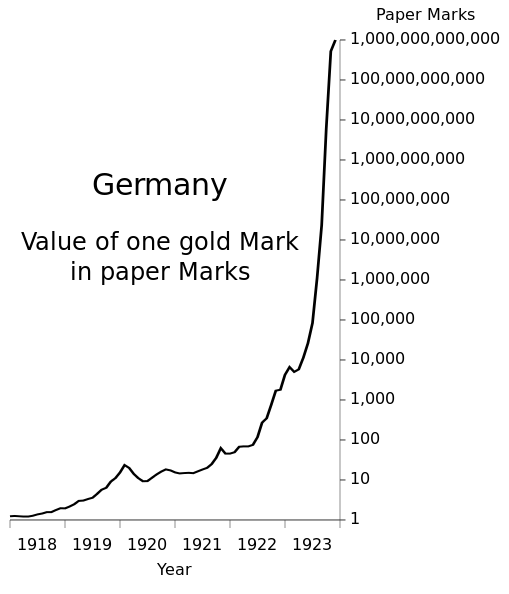 The Gold Mark which was still tied to the value of gold, and the Paper Mark, a fiat currency tied to, well, let me think, I guess it would be the full faith and credit of the insolvent German economy...i.e.) nothing. 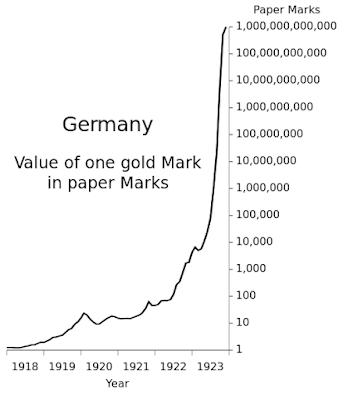 So the Reichsbank abandoned the gold standard for Paper Marks and started the printing presses. 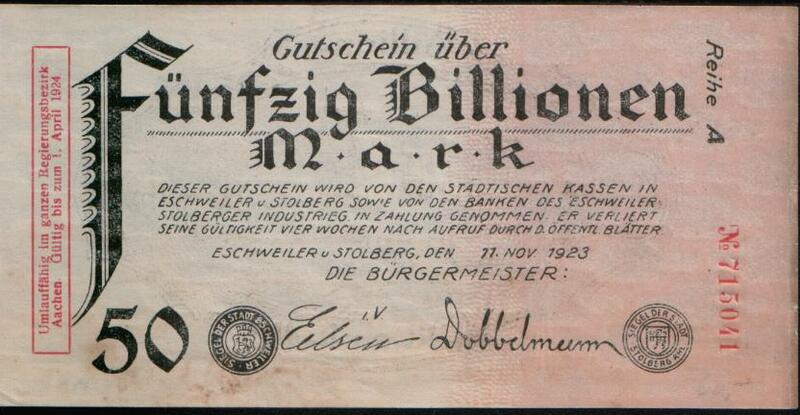 Before the war the Deutsche mark (backed by gold) was trading at about 4 to the US$. After the treaty of Versailles the Reichsbank came up with a plan to pay all of its external debt and reparations using FOREX as required by the Allies (We don't want no stinkin' Paper Marks). They could buy FOREX using Gold Marks and run the domestic economy using Paper Marks. As you might suspect, this plan worked almost as well as their "Hey, Let's start World War I" plan. The chart on the left illustrates what happened when they turned on the printing presses. The Paper mark became worthless. By November of 1923, one US dollar was was worth 4.2 Trillion Paper Marks. It was the greatest short in history (if you could find anyone to take the other side of the trade). Below is a 50 Billion Mark note. 84 of these notes were equal to one US Dollar at the time. It's remarkable how quickly the currency crashed. Once the world caught on to the difference between Paper Marks and Gold Marks, the currency became worthless in only a few years. The relationship between the Gold Mark /Paper Mark and today's CNH/CNY seem eerily familiar. The CNH (Like the Gold Mark) is backed by FOREX/Reserve Currency. 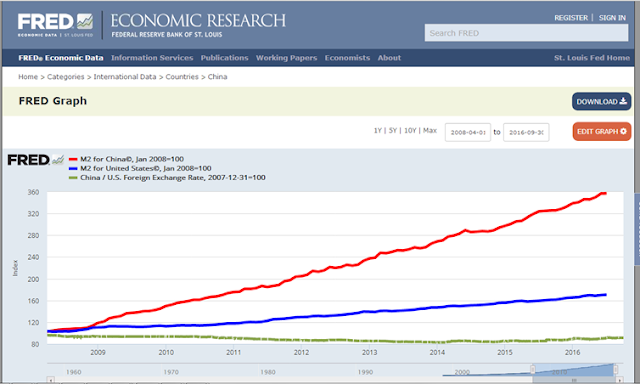 The CNY (Like the Paper Mark) is backed by the full faith and credit of China's out of control money supply. I've been unable to locate the approximate amount of currency printed by the Weimar Republic during the period, but I'd be hard pressed to believe that it would approach 15% of Global GDP, like the PBOC has accomplished with China's money supply over the last few years. (2015 Global GDP US$ 73 Trillion vs. China's US$10 Trillion M2 Increase since 2011) Based on China's above described money and debt expansion, it would appear that China may be on the same economic/financial path as the post World War I Wiemar Republic. If there are any economic historians out there who are experts on the Wiemar Republic hyperinflation I'd enjoy hearing from you. Since this isn't my first rodeo, I know that if you've read this far, and you truly understand the gravity of what I'm describing: i.e.) That the world's second biggest economy is little more than a sophisticated Ponzi scheme, and like me, these numbers are scaring the snot out of you, your next question is undoubtedly "What happens next?" For most investors, when this tsunami finally hits the financial markets we will all be running for cover trying to figure out what just happened. When the dust settles we'll be paralyzed, like a bankrupt former client of mine once quipped: "I really can't remember what happened to all of the money.....I probably spent most of it on whiskey and women....I guess I just pissed the rest of it away....."
Coach AVA Leather Tote Bag - "Coaches signature PVC"
U.S. Treasury Secretary Jacob Lew warned Beijing in unusually candid language about China’s overproduction and overbuilding, which he suggested could become the biggest U.S. complaint about the country, as their earlier disputes over the country’s exchange rate become less divisive. “I’m talking about steel, I’m talking about aluminum, I’m talking about real estate—when you don’t have market forces driving investment, when you don’t have bad investments allowed to fail, you end up with resources allocated in a way that ultimately chokes the future of economic growth,” Mr. Lew said at the Peterson Institute for International Economics on Thursday.